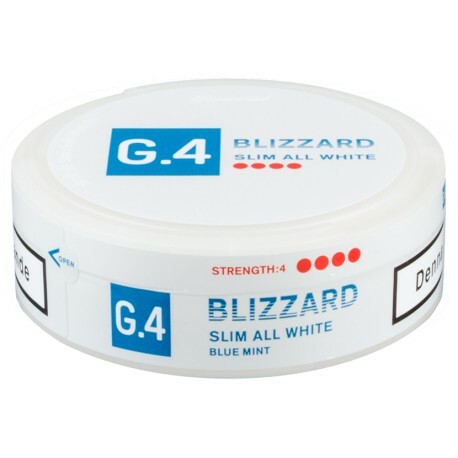 G.4 Blizzard Slim Extra Strong All White Portion is effectively Swedish Match's answer to Epok Snus. A new whitish snus, which is white before, during and after use. The pouches are soft in the fit and delivers a long-lasting nicotine and taste experience. Absolutely without traces of tobacco flavor...but bursting with a nuanced mint flavor! G.4 Blizzard Slim All White Portion reminds me of what Swedish Match did back in ancient times with Reynold's American released Camel Frost SNUS, their most popular flavor. Swedish Match created General Mini Mint snus and blew Camel Frost out of the water. Another win for Swedish Match. I buy an occasional tin of mint or wintergreen maybe once a year and usually don't finish a tin. I gave the Blizzard a try this time and was pleasantly surprised. I get a slightly subdued and not overpowering, flavor, nice mint, eucalyptus, and tobacco in the backround, with plenty of nic. The fact that it is white? So what. I do like the portion size. I like this snus, but unfortunately about 10% of the portions I received (out of 10 cans) were not completely sealed or had a small hole that caused tobacco to burst out upon "fluffing" the snus with my fingers. For now I think I'll stick to Epok, although this snus is better if they can work out the issues with the portions coming open. I loved all 3 of the G:4 products. They're similar to Epok in the white tobacco but in my case I think they lasted longer & felt better in the lip compared to the Epok portions they always seem to "wrinkle" after a bit. The mint here is great & not too sweet & lasts a good while also!